by Bill Dwight on Monday, November 23, 2009 at 6:16 PM | LEAVE A COMMENT! As you can see on the screen shot above, we've settled on a subscription price of $5.99 per month per family. For a family of four, that works out to around $1.50 a month per member. It's cheap, but it isn't free, which is what a lot of folks have come to expect on the Internet. A free approach would require us to plaster the site with a bunch of ads and affiliate links. As we alluded to earlier, encouraging a bunch of impulse buying to fuel our business just isn't consistent with teaching kids how to moderate their spending. We'd rather cater to a smaller audience of paying customers and stay true to our mission. We will be providing a generous free trial period so families can adequately assess the value before committing. And, we'll make it easy to cancel at any time. Yeah, it's minor, but sometimes it's the little things that make all the difference. Oh, and now is a great time to create your Holiday Wish list (like the one above) and share it with the family. You can even set it up to send a text message to the rest of the family whenever you add an item - just for that little extra prodding! P.S. 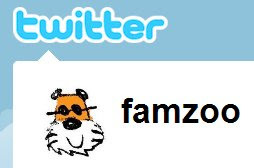 Do you like FamZoo? Show us some love by becoming a fan on our facebook page. by Bill Dwight on Monday, November 16, 2009 at 11:56 AM | LEAVE A COMMENT! Yeah, we're working on Henry to supply us with an Angry Dad too! by Bill Dwight on Monday, November 09, 2009 at 12:55 PM | LEAVE A COMMENT! 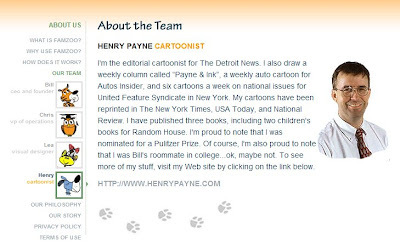 It was another "under-the-hood" week for FamZoo, so you won't (or shouldn't!) see any visible changes after today's upgrade. Last week, we made more progress on billing and payment integration with Paypal as well as the mechanics of redeeming coupons and supporting free trial periods for new subscribers. Come visit our page on Facebook and become a FamZoo fan to help us spread the word! by Bill Dwight on Monday, November 02, 2009 at 9:57 AM | LEAVE A COMMENT! There aren't many visible changes in the upgrade this afternoon (Monday, November 2nd) because we've been spending much of our time on behind-the-scenes work for supporting subscriptions and coupons. You've probably noticed that we show recommendations for family-friendly products as well as charitable organizations in the right hand sidebar of our site's pages. When you buy a product after clicking through one of these links on our site, FamZoo receives a small percentage of the revenue. This is known as affiliate marketing and is one of the revenue models that we're experimenting with. Right now, we just have a few products that Chris and I have recommended for testing purposes. We just added a couple more this week for some favorite books as well as two charitable "ads" for DonorsChoose and NothingButNets. Ultimately, if we decide to pursue this model, we'll open things up for any member to nominate products that we will display at our discretion. We'll also allow members to comment and vote on products appearing on the site. Unpopular products (as judged by our members) would be dropped from the site. All that said, we really have no intention of gumming up the site with a bunch of random advertising. That just wouldn't be in keeping with our mission of promoting sensible spending habits. So, our overwhelming preference is to buck the Internet trend and rely on modest subscription fees to build a viable business. We've decided to go with Paypal for handling subscription payments and have begun writing the underlying code to integrate with their services. We'll be working on the plumbing first and the screens will follow in the next few weeks.